“The hairstreaks are among the most exquisite and delicate of all our butterflies” wrote Clarence M. Weed of the Lowell State Normal School, a century ago in his popular book Butterflies Worth Knowing (1919: 242). With only one short flight period each July, our seven Satyrium hairstreaks are somewhat elusive. But they can be differentiated by host plant and degree of specialization. The Banded and Oak Hairstreaks have several hosts among the oaks and hickories, and the Striped Hairstreak uses mainly cherries but has several hosts among the Rosaceae and Ericaceae. On the other hand, the Edwards’, Hickory, Coral and Acadian Hairstreaks are more specialized: Edwards’ selects mainly scrub oak, the Hickory Hairstreak bitternut hickory, the Coral cherries, and the Acadian willows. First described by Hübner, Banded Hairstreak was known as Thecla falacer to most nineteenth century lepidopterists, and the name ‘falacer’ is still attached to the subtype which flies in most of eastern United States (e.g. Pelham 2008). In Massachusetts, Harris (1862) described a ‘Thecla falacer’ which could be either a Banded or an Edwards’; Scudder says it’s an Edwards’ (1889:892). There is no Banded Hairstreak in Harris' 1822-1850 collection (Index). But F. H. Sprague collected it in Wollaston (now Quincy) in 1878 (Sprague 1879b); this and an 1869 specimen from Andover are the earliest dated specimens in the MCZ. As forests declined between 1600 and 1850, this hairstreak may have suffered population losses (Table 1), but edge habitat and nectar sources probably increased, and Banded Hairstreak still seems to have been common by 1900. Maynard (1886) says Banded Hairstreak was “not uncommon in Massachusetts” in July. Scudder (1889: 890) found the Banded well distributed in the state, listing specimens from Andover, Woburn, Dorchester, Wollaston, Quincy, Cape Cod, Amherst, Springfield (“abundant”), Mt. Tom, Leverett, Mt. Toby, and Montague. F. H. Sprague's specimens from Amherst (1885), Deerfield (1885), North Leverett (1878), and Montague (1885) are in the Harvard MCZ. There does not seem to be much evidence for change in the status of Banded Hairstreak since Scudder’s day. One might expect population increases as forests re-grew, followed by declines where forests became dense and closed-canopied. Habitat gains in some areas were probably balanced by losses in areas of heavy development. Early twentieth-century (1900-1945) specimens in the Harvard MCZ and at Boston University show Banded Hairstreak to have been present in Harwich, Needham, Tyngsboro, Wellesley and Weston. Farquhar (1934) adds Andover, Boxford, Essex, Marblehead, Middleton, and Stoneham north of Boston, as well as Woods Hole, to the south, Auburndale (now Newton), Brookline, Waltham and Malden around Boston, and Amherst to the west. At the AMNH and at UNH are many 1930's specimens from Fall River, and at McGuire Center are 1930's specimens from Middleboro. By the 1940’s it is reported to be “widely distributed” on Martha’s Vineyard (6/30/1944 C. P. Kimball specimen in MCZ), but is still “not recorded” from Nantucket (Jones and Kimball 1943). In 1954 it was documented from Myles Standish SF in Plymouth (7/26/1954, H. C. Belcher, AMNH), and in 1956 from Mt Greylock (8/9/1956, New Ashford, no coll., MCZ). Through the 1960’s and 1970s, museum specimens and Lepidopterists’ Society records continue to show Banded Hairstreak in many locations around the state. Mark Mello collected it in New Bedford in June 1961. James Holmes reported it “common” on Cape Ann in early July in 1965, 1966, and 1967. William D. Winter collected it in Westwood in 1972. Some of the earliest Berkshire County specimens were collected by Rene Wendell, Sr. in Pittsfield (6/29/1981), Great Barrington (7/1/1981), and Sheffield (7/8/1988) (corresp. with R. Primack, 1/24/2011). 1973 was a particularly good year for this species: Winters reported it “extremely common everywhere” in the Westwood area, and Patrick Carey of South Hadley reported it “swarming in large numbers on Cedar Knob in Holyoke.” 1974, on the other hand, saw a population drop. R. Robbins, working in Middlesex Fells, reported to L. P. Grey that year that both “Satyrium calanus and S. liparops suffered a drastic (about 100-fold) decrease in population numbers from the previous year. A cold spell during the last week in June (the peak emergence time for these species) may have been a contributing factor.” (Robbins' 1969-1976 specimens from Medford and Woburn are in the Smithsonian Institution.) And Willis reported both Banded and Striped Hairstreaks “down” in the Holliston-Sherborn-Framingham area, as compared to 1973 (Lep Soc. Seas. Sum. and Corresp., 1959-1976). Banded Hairstreak’s larval hosts across its range include chestnut oak (Quercus prinus), white oak (Q. alba), red oak (Q. rubra), as well as American chestnut (Castanea dentata), walnuts (Juglans spp. ), and hickories (Carya spp.) (Scott 1986). In Massachusetts, the main hosts appear to be oaks, especially red (Q. rubra) and scrub (Q. ilicifolia) oaks. Sam Jaffe found Banded Hairstreak caterpillars abundant in the Great Blue Hills in 2009, and scrub and red oaks were the dominant hosts. He found one caterpillar on hickory and one eating birch at Wompatuck State Park (Jaffe 2009). In 2002, D. L. Wagner and others found Banded Hairstreak larvae on Q. ilicifolia in Foxborough, MA (comm. from J. O’Donnell to C. Hitchcock, 12/3/2010), and in June 2013 on red oak at Great Blue Hill. Interestingly, the Connecticut Atlas found Banded Hairstreak larvae in the wild only on hickories -- shagbark (Carya ovata), pignut (C. glabra), mockernut (C. tomentosa) -- and black walnut (Juglans nigra) and butternut (Juglans cinerea), but not on oaks. Banded Hairstreak is usually found in open woodlands, and along the edges of deciduous forests. Males defend perches in sunlit areas of woods or woods edges; where abundant they can be seen whirling upward in groups defending territories. Local population explosions have been reported: at the NEWFS garden in Framingham 48 were reported on 6/28/2014 dogfighting "packs of 8 or more" (G. Dysart), and the same day 25 were reported in one backyard in Shrewsbury in "swirling masses" (B. deGraaf). Adults also need nectar sources: R. Walton observed that meadowsweet, milkweeds and smooth sumac are highly attractive, among the 17 species of nectar sources counted during the Atlas period. It has also often been observed nectaring at New Jersey tea. Banded Hairstreak larvae may be tended by ants (O’Donnell et al., 2007), but detailed research is needed. Although the 1986-90 MAS Atlas termed this hairstreak “fairly common,’ it was found in only 93 of the 723 blocks searched, ranking it as “Uncommon” relative to other Atlas species (Table 5). Hairstreaks in general are not as frequently encountered as species with longer flight periods and multiple broods. Chart 20 does not show any marked trend upward or downward in sightings 1993-2009, just a small year-to-year variation within a narrow range. A Breed et al. (2012) list-length study of MBC data did not find any statistically significant change in the detectibility of this butterfly between 1992 and 2010. Chart 20 shows a highly unusual number of Banded Hairstreaks in 1992; this ‘outlier’ reading is due to an incredibly high number reported from the Foxboro NABA Count that year. While Banded Hairstreaks do exhibit local population expansions (see above), a population explosion of such magnitude was not seen in any of the subsequent 17 years of MBC field trips and counts statewide. The Foxboro NABA Count of the same area the next year (1993) turned up only 17 Banded Hairstreaks, and Foxboro counts in succeeding years never topped 25. 2011 and 2013 (not shown on chart) were years in which good numbers of Banded Hairstreaks were seen, with high counts at a number of well-known locations. 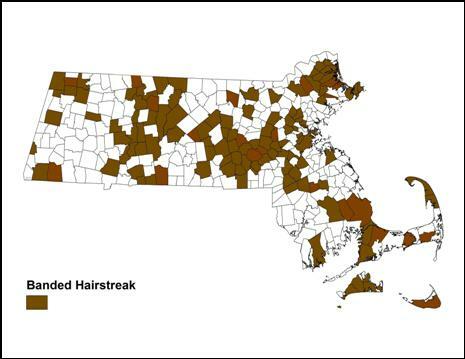 Banded Hairstreak is reported from 126 out of 351 towns 1992-2013, and is broadly distributed across the state, from the Berkshires to the islands. With some searching, it could probably be found in all towns not heavily urbanized. However, the larger concentrations have been reported from east and central Massachusetts; the numbers from Berkshire County have been comparatively low. With the discovery of a Banded Hairstreak on Nantucket in 2011 (9/9/2011, E. LoPresti, M. Pelikan, et al. ), the distribution can now be extended to that island; until 2011 there were no MBC, Atlas or historical records for Nantucket (LoPresti 2011; Jones and Kimball 1943). Banded Hairstreak is frequently reported from Martha’s Vineyard; the Vineyard Checklist (Pelikan 2002) ranks it as “Uncommon” there. It can also be reliably found on Cape Cod; Mello and Hansen (2004) report several productive locations, and it is often reported on the Cape NABA Counts. Banded Hairstreak is usually found in small numbers at any one location, but some locations have yielded particularly high numbers from a single visit. Two especially reliable and productive locations are Horn Pond Mountain in Woburn, and Great Blue Hill in Canton, both “mountain-top islands” near Boston, surrounded by dense suburbs. At Horn Pond Mountain, Banded Hairstreaks are found nectaring on New Jersey tea in early July in company with other hairstreaks; the largest concentrations reported are 40 on 6/29/2013 H. Hoople et al., 18 on 6/23/2004 M. Rines and R. LaFontaine; and 17 on 6/27/2008 R. LaFontaine. At Great Blue Hill south of Boston, recent high counts are 58, 6/30/2013, S. Moore et al. ; 75, 7/3/2011, E. Nielsen (and 50 and 30 on 6/29/11 and 7/6/11 by other observers); and 39 on 7/8/2006 M. Champagne and E. Nielsen. Sam Jaffe in 2009 found Banded Hairstreak caterpillars to be abundant in the Blue Hills, especially common on the western face and summit of Great Blue Hill, but also present on the slopes of Buck Hill and Chickatawbut. He also found many larvae at Wompatuck State Park in Hingham. Other locations from which larger numbers have been reported are Framingham Garden in the Woods, 26 on 6/28/2012 and 48 on 6/28/2013 G. Dysart; Falmouth, 20 on 7/14/2013, A. Robb et al. ; Shrewsbury deGraaf yard, 25 on 6/28/2013 B. deGraaf; Montague, 49 on 7/6/2013 T Gagnon and B Callahan; Williamstown, 13 in one location on 7/14/2012 B. Zaremba; Rowley Stackyard Road, 20 on 7/4/2011 B. Zaremba; Sandwich Mass. Military Res., 18 on 7/16/2011, E. Neilsen and P. Trimble; Worcester Broad Meadow Brook, 6 on 7/3/2007 B. Walker (higher numbers in the 1990's). Other good locations have been Wellfleet Wellfleet Bay WS, Waltham Paine Estate, Princeton Wachusett Meadow WS, Newbury Old Town Hill, Mt. Greylock; Milford power line, Hopedale Draper Park, Hingham World's End TTOR, and Hadley Mt. Holyoke. At most of these locations the numbers seen can vary greatly from year to year. Banded Hairstreak has been found on the Blackstone Valley NABA Count every year 2001-2013, max. 23 on 7/14/2001; on the Central Franklin NABA Count every year 1992-2013, max. of 73 on 7/3/2005; and on the Northampton NABA Count every year 2001-2013. It is usually reported on the Concord NABA Count, with a high of 10 on 7/10/1993, on the Martha's Vineyard Count, and the Cape Cod Counts, notably Brewster and Falmouth. Like all our Satyrium hairstreaks, Banded Hairstreak has a single, annual brood. MBC 1993-2008 records show a flight time stretching from the second week in June through the third week in August, with a peak the first two weeks of July (http://www.naba.org/chapters/nabambc/flight-dates-chart.asp). Unlike Coral Hairstreak, Banded Hairstreak does not appear to have advanced its flight period significantly over the 1986-2009 period, according to a study using both MAS Atlas and MBC records (Polgar, Primack et al. 2013). However, calculations over a longer time period (1986-2012) do show some flight advancement by Banded Hairstreak, although not as much as that of other hairstreaks (Williams et al. 2014). Latest Sightings: Over the 23-year period 1991-2013, the five latest "last sighting" dates are 8/20/1992 Foxboro, B. Cassie (also reported by the MAS Atlas); 8/19/2006 Topsfield, M. Arey; 8/17/2000 Groveland, F. Goodwin; 8/12/2007 Leicester, M. Rowden; and 8/11/2006 Paxton, E. Barry. In 2003 through 2009, all ‘last seen’ dates were in August, rather than July, but in 2010, 2011 and 2013 the last reports were in July. Scudder makes the somewhat surprising statement that “It is much more abundant during July than subsequently, but occurs also during the whole of August and has even been taken in the first week of September...” (1889: 890-1). A search of MCZ and Boston University specimens shows no September Banded Hairstreaks from Massachusetts; the latest taken in this state in the 19th or early 20th centuries was 8/11/1883, North Leverett, Mass. by F. H. Sprague. Scudder may have been referring to Connecticut or Rhode Island. 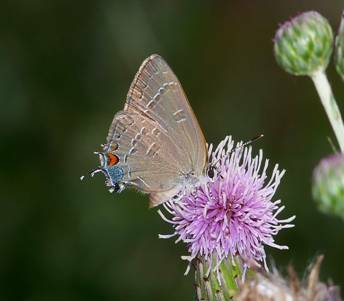 Cech (2005) describes this hairstreak as “flexible and adaptive,” perhaps because of its variety of tree hosts and tolerance of nearby disturbed areas. It seems able to persist in small patches of open woodlands, and edges, so that while it does not survive in dense forests or dense urbanized areas, it has been reported from some urban parks and suburban back yards. Banded Hairstreak’s plant hosts and habitat are common across Massachusetts, and its NatureServe rank of S5, or ‘secure,’ for the state seems warranted. It is also S5 in Connecticut. Its present range extends south to mid-Florida, so that climate warming here would not seem to pose a problem.